I am just so happy today!!!! 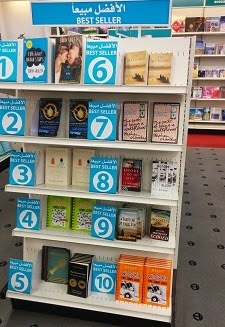 We went to Jarir bookstore and bought two of some of my top favorite books. I finished "The Long Haul" and it was really funny. I just want to say that Greg and his family should avoid road trips. I have never heard of such a complicated trip. It was the same for Manasy while reading "Allegiant". Me: Something really big happens at the end. Manasy: I don't want to hear about it! Manasy: La La La.. I can't hear you!!! Ever since Dad bought his Nexus 5 with KitKat, he spends his time on it and still he hasn't discovered about all its features. Today morning, he got the new Android “Lollipop". We are guessing about the next name of android starting with M, and Mom said “Muffin”, I said “Maltesers” or “M&M”, and Dad said “Milkshake”.